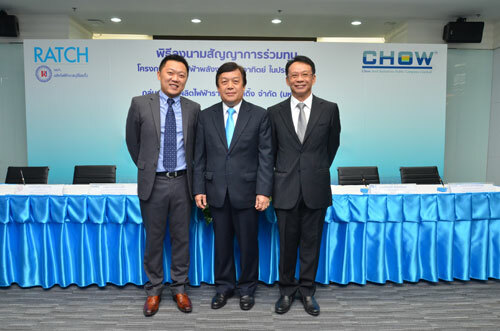 Nonthaburi- Ratchaburi Electricity Generating Holding Public Company Limited ("RATCH") and CHOW Steel Industries Public Company Limited ("CHOW Steel Group") stated that both companies reached partnership for joint investment in solar power projects in Japan. On September 12, 2014, subsidiaries of both parties signed the shareholders agreements to establish two joint venture companies which were held 60% stake by RATCH and 40% stake by CHOW Group. The said two joint venture companies as an investment arm will invest in solar power projects in Japan. The initial investment phase will cover two projects with 33 megawatts total dispatched capacity when the commercial operation date (COD) is scheduled in 2016. Mr. Pongdith Potchana, Chief Executive Officer of RATCH, revealed that the agreement signing marks substantial progress for RATCH striving to be a leading integrated energy company in Asia-Pacific under the business strategies to seek partners for enhancing our potentiality and competiveness, coupled with expanding into new markets. Japan is also one of our targeted investment destinations, particularly for renewable energy business. It is obviously shown that the Japanese government currently agrees to purchase 7,000 megawatts electricity generated from solar energy. "Partnering with CHOW Steel Group that has extensive experience and expertise in doing business in Japan will help increase our business opportunity and competitiveness.The common aim to expand renewal energy investment also helps drive our co-invested solar power projects in Japan toward success. The 33 megawatts dispatched capacity of two solar farm projects is initiated with commercial operation in 2016. The Company strongly believes that both partners will be able to develop and extend cooperation in other projects in the second phase," Mr. Pongdith added. Mr. Anavin Jiratomsiri, Chief Executive Officer of CHOW Steel Group, disclosed that this partnership between CHOW Steel Group and RATCH Group is considered to be another significant step in expanding the renewable energy business to Japan where there are great opportunity and potential investment. According to the Japanese government's intention to increase the solar power production capacity, Japan is regarded as attractive destination for renewable energy investment from most international investors. We believe that the synergy between the two parties will enhance our competitive advantages and accomplish ultimate goal as targeted. Both parties join hands to invest in Ueda Solar Farm Project located in Nagano prefecture and Iwaki Solar Farm Project in Fukushima prefecture with dispatched capacity of 10.8 megawatts and 22.6 megawatts respectively. The 20-year Power Purchase Agreements (PPA) of those two projects are made with major off-takers of the region and granted JPY40 feed-in tariff per unit (excluding consumption tax) from the Japanese government that will strengthen the cash flow of both companies more steady and stable. The joint venture is made through their subsidiaries by signing shareholders agreements in order to establish two joint venture companies as an investment arms in the above mentioned projects in Japan. It includes a joint company between RH International (Singapore) Corporation Pte. Limited (RHIS) owned 60% equity and Chow International Company Limited (CI) with 40% stake, with an aim to invest in solar farm projects in Japan, and a management service provider company co-owned by Ratchaburi Energy Company Limited (RE) with 60% equity and Premier Solution Company Limited (PSCL) with 40% stake.